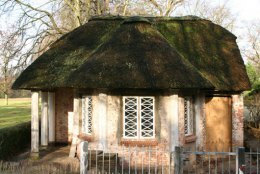 Between Flottbektal and the Elbe, in 1785 the Hamburg merchant and patron Caspar Voght began to construct a model estate along the lines of an English paradigm, an “ornamental farm” as an agrarian park landscape. The land area was divided into four parks with names of the four primary directions. Senator Martin Johann von Jenisch, who acquired the landed estate, selected the South Park for the location of his country house, constructed from 1831 to 1833 according to draft designs by the architects Franz Forsmann and Karl Friedrich Schinkel. The entrance gate then was located on the Holztwiete road. In 1906, the impressive neo-Baroque Kaiser-Gate was built- allegedly for the visit of the Kaiser Wilhelm II, which quickly became an emblem of the Elbchaussee area. 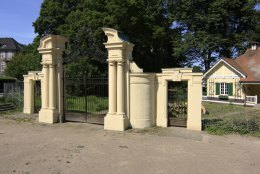 The Hamburg Monument Foundation supported restoration of the Kaiser-Gate and the buildings for gardeners and park keepers at the entrances to the grounds.